As a reference to the painting 'La Victoire' by Rene Magritte, 'Ajar' is a surreal gateway: a spiritual journey through the imagination, an interactive sculpture that children will enjoy as much as adults. It is a key to the imagination: unlocking ideas of the infinite as mused on by Aldous Huxley quoting Blake, "If the doors of perception were cleansed, everything would appear to man as it is, infinite." It simultaneously references both Duchamp's work '11 Rue Larrey', a corner door that is always open and shut and a Bugs Bunny sketch, where a door in a frame freely stands on a cliff in a landscape. 'Ajar' is placed without walls and is permanently half open encouraging the choice to go around, or go through. I went to St Botolph not with the intention of seeing art - although that was an added bonus - but to visit a church that is reputedly haunted. In fact it is the scene of a famous photograph many believe shows a ghost. One Saturday in 1982 a picture was taken inside the church by photographer Chris Brackley. When he developed it, he saw a shadowy figure of a woman on the balcony. She had definitely not been there when he took the shot. Other effects, such as double exposure, were ruled out. The picture is still a mystery and might indeed show something supernatural. 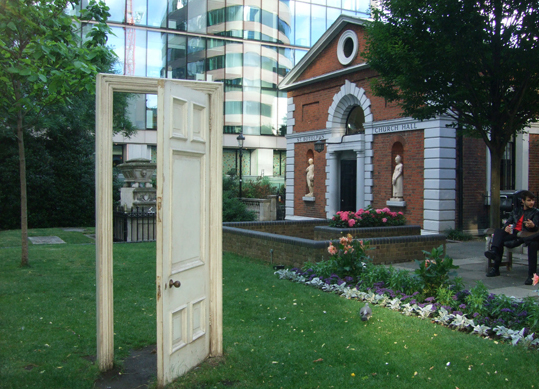 St Botolph is one of the stops on a ghost walk in the book Walking Haunted London. I'll share a few more photos I took along the route on my blog in the future. You can view Walking Haunted London on Amazon.